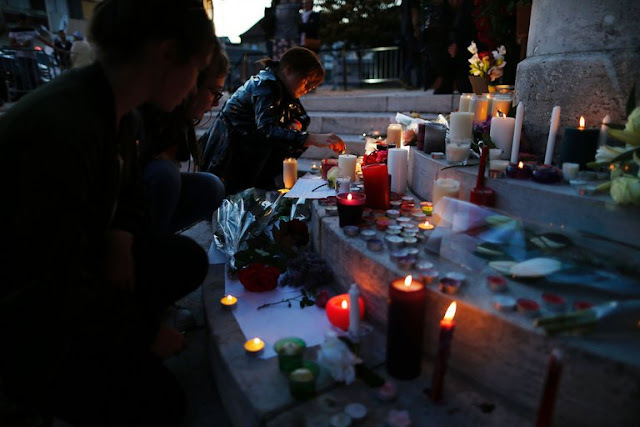 PARIS — One of the two young men who killed an 85-year-old priest in a town in Normandy on Tuesday had been detained for nearly 10 months after twice trying to travel to Syria, but he was released in March over the objection of prosecutors, according to French officials. The young man, Adel Kermiche, 19, was born in Mont-St.-Aignan, a town about five miles away from St.-Étienne-du-Rouvray, where he killed the priest, the Rev. Jacques Hamel, at the end of morning Mass. Mr. Kermiche and the other attacker, who has not been identified, were shot dead by the police. Five other people — three nuns and two parishioners — were held hostage at the church; one of the nuns escaped, but one of the parishioners, an 86-year-old man, was critically injured. The Islamic State claimed responsibility for the attack. The news that Mr. Kermiche was known to the authorities was announced Tuesday evening by François Molins, the Paris prosecutor, who oversees terrorism investigations. It immediately raised new concerns about the government’s ability to prevent radicalized young people from traveling to Syria and committing acts of terrorism. On Wednesday, a former president, Nicolas Sarkozy, who is expected to be a candidate in the 2017 presidential elections and has proposed constitutional changes to crack down on terrorism, seized on the news to criticize President François Hollande’s government for not doing more to protect the country — an accusation that top officials, including Interior Minister Bernard Cazeneuve, called baseless and politically motivated. The details of Mr. Kermiche’s life suggest a man who desperately wanted to get away from France. On March 23, 2015, a relative reported that he had disappeared. The same day, German authorities detained him as he tried to use identification papers belonging to his brother to travel to Syria. The following day, he was returned to France and placed under detention. On March 28, 2015, he was charged with attempting a criminal act and placed under judicial supervision. He was ordered not to leave the Seine-Maritime department, where he is from, and was required to report once a week to his local police station. Mr. Kermiche was not deterred, however, from his goal of becoming a jihadist. Just over a month later, he left home. An international arrest warrant was issued for him, and on May 13, 2015, he was arrested after flying to Turkey from Geneva — this time using his cousin’s national identity card. The Turkish authorities sent him back to Switzerland, and on May 22, 2015, the Swiss authorities sent him back to France. There he faced new charges for violating judicial orders by trying to go to Syria. He was detained until March 18 of this year, when a counterterrorism judge allowed him to go home, but under house arrest, with electronic monitoring. He was permitted to leave his house from 8:30 a.m. to 12:30 p.m., Monday through Friday, and from 2 to 6 p.m. on weekends and holidays. The authorities confiscated his national identity card and passport. The Paris prosecutor’s office appealed the decision to let Mr. Kermiche go home, but on March 25, an appellate court upheld the judge’s decision to release him under house arrest. In addition, a 16-year-old native of Algeria was arrested in St.-Étienne-du-Rouvray at 11:40 a.m. on Wednesday, Mr. Molins said. The teenager is the younger brother of another man who is wanted by the authorities for having used Mr. Kermiche’s identity card on March 20, 2015, to leave France, headed for Iraq or Syria.